Please see the previous article at http://ponnadi.blogspot.in/2014/09/virodhi-pariharangal-35.html. anAptha (untrustworthy persons/aspects that are unfavourable for oneself) is the opposite of Aptha (trustworthy persons/aspects that are favourable for oneself). The matters discussed in this section also reflects the same principle. Translator's note: This section is really a continuation of the previous section. What is unfavourable for the spiritual nature/progress of the jIvAthmA is discussed in this section. Having faith in upAyAntharams (karma, gyAna, bhakthi yOgams as the means to achieve eternal kainkaryam to bhagavAn) which are contrary to prapaththi (total surrender) is an obstacle. AzhwArs explained and practiced total surrender to bhagavAn as the only means to achieve eternal kainkaryam to bhagavAn. Different processes such as karma yOgam, gyAna yOgam, bhakthi yOgam, etc., are focussed on self-effort and are thus contrary to the true nature jIvAthmA who is eternally sub-servient to bhagavAn. Thus, having faith in such upAyAntharams are unfavourable and not apt for the true nature of jIvAthmA. Translator's note: Our AzhwArs/AchAryas have fully established that total surrender to bhagavAn is the only means to achieve eternal kainkaryam to him. piLLai lOkAchAryar explains this principle in the second prakaraNam of srIvachana bhUshaNa dhivya sAsthram. In sUthram, he first starts with saying that we give up upAyAntharams due to them being contrary to the nature of our total dependence on bhagavAn and not due to ones lack of knowledge and ability. In the subsequent sUthrams, he explains this principle in great detail. He also himself raises a question in sUthram 127 that "why vEdhAnthams highlight these as upAyams?". He himself answers that just like when someone with a disease is treated, they (mother, etc., with care) mix the medicines in food-items that are dear to them, here sAsthram (which is like mother in caring for jIvAthmA) mixes bhagavAn (who is the real medicine) with upAyAntharams (that are based on self-effort and due to their nature of involving self-effort they are dear to jIvAthmAs who have been in samsAram from time immemorial). mAmunigaL beautifully explains that just like the medicine itself is the real cure and not the additional food-items, similarly, bhagavAn is the real upAyam (means) to relieve oneself from samsAram and the upAyAntharams are never going to be real upAyam. He also explains when the medicine is mixed with other food-items, it will take longer to cure the disease. Similarly, going through the karma, gyAna, bhakthi yOgams, it will take a lot longer to be relieved from the clutches of samsAram. But approaching emperumAn directly is like taking the medicine directly to cure the disease - the result will be immediate. In the subsequent sUthrams, many wonderful meanings are revealed by piLLai lOkAchAryar and mAmunigaL - it would be greatly worthwhile to listen to these in kAlakshEpam method from an AchArya. Even after knowing that having friendship with unfavourable persons is to be given up, being in dilemma that what if we have to mix with them is an obstacle. One must have strong conviction that any connection with unfavourable persons is to be given up. Translator's note: Here unfavourable persons generally mean those who are attached to dhEvathAntharams, materialistic pursuits and ones who are constantly engaged in bhagavAth, bhAgavatha, AchArya apachArams. Because these kinds of people will influence our thoughts also to become like them eventually. Having attachment in ulterior benefits that are hurdles for the ultimate goal is an obstacle. Anything that is contrary to eternal kainkaryam to bhagavAn for his pleasure alone is called prayOjanAntharam. Such ulterior motives should be given up. Translator's note: Our ultimate goal is to serve bhagavAn in paramapadham eternally for his pleasure alone. Other goals such as materialistic/sensual pleasures, serving dhEvathAntharams, serving materialistic persons, kaivalyam - enjoying the self, serving bhagavAn for the pleasure of the individual self, serving bhagavAn with pride, etc., are all unfavourable for the true nature of jIvAthmA and thus be given up. Having faith in dhEvathAntharams which is contrary to the principle of srIman nArAyaNan being the only worthy/worshippable deity is an obstacle. 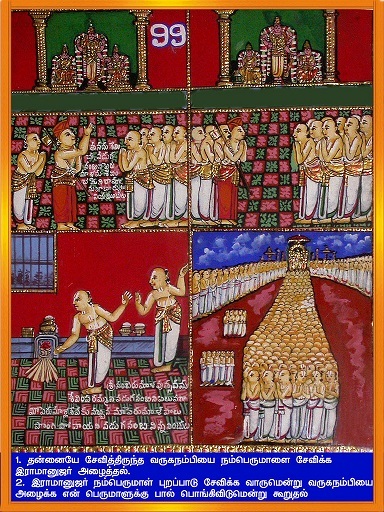 For a vaishNava, srIman nArAyaNa being the only worshippable deity is an important principle to understand and follow. dhEvathAnthara bhajanam (worshipping) is contrary to that principle and thus should be given up. Translator's note: srIman nArAyaNan being the supreme lord himself, established many many dhEvathas to conduct the worldly activities and also for the worshippers who are of thAmasa (passion) and rAjasa (ignorance) nature so they too can slowly evolve spiritually. Otherwise atheism will become abundant. But for his pure devotees who are full situated in sathva guNam (goodness), he alone is worshippable. Being a vaishNava means being fully faithful to srIman nArAyaNan and his pure devotees and worship them alone. Having faith in manthrams that are contrary to the principles explained in dhvaya mahA manthram is an obstacle. dhvaya mahA manthram is to be constantly recited and meditate upon by srIvaishNavas due to its sweetness and depth of meanings. Due to the related/explanatory nature, rahasya thrayam (thirumanthram - ashtAksharam, dhvaya mahA manthram and gIthA charama slOkam) is indicated here by highlighting dhvaya mahA manthram. Thus rahasya thrayam is to be pursued by srIvaishNavas. Any other manthrams - mainly manthrams related to dhEvathAntharams are to be totally given up. Translator's note: In mumukshuppadi, piLLai lOkAchAryar explains the glories of thirumanthram. He first explains that manthrams related to srIman nArAyaNan are of two types - vyApakam (those which explain bhagavAn's omni-presence) and avyApakam (those which explain bhagavAn's other qualities that are revealed in his different forms). He highlights that vyApaka manthrams (nArAyaNa, vAsudheva, vishNu) of greater significance since they are highlighted in vishNu gAyathri. He further says that since vishNu gAyathri starts with nArAyaNa manthram, that is the greatest of all vishNu manthrams. He further says nArAyaNa manthra is complete in explaining all the essential meanings which is lacking in other manthrams. Here essential meanings implies artha panchakam (the five entities/principles, i.e., jIvAthmA (soul), paramAthmA (God), upAyam (means), upEyam (goal) and virOdhi (hurdles)). He further goes on to explain that nArAyaNa manthram is very dear to vEdham, rishis, AzhwArs and AchAryas. dhvaya mahA manthram is simply the explanation of nArAyaNa manthram and charama slOkam is further explanation of the same principles. Thus, rahasya thrayam is main focus of mumukshus (those who are desiring for mOksham - eternal kainkaryam to srIman nArAyaNan in paramapadham). Having interest/attachment in worldly/sensual pleasures which are contrary to our ultimate state of having attachment to bhagavAn alone and being enjoyed by bhagavAn alone is an obstacle. bhOgyam - that which is enjoyed. jIvAthmA performing kainkaryam to bhagavAn/bhAgavathas brings joy/pleasure to bhagavAn. Seeing that joy in bhagavAn, the jIvAthmA also becomes blissful. Any other worldly pleasure is simply a hurdle for jIvAthmA's natural postion. Translator's note: kulasEkara AzhwAr declares in perumAL thirumozhi 4.9 "padiyAykkidanthu un pavaLavAy kANbEnE" (படியாய்க்கிடந்து உன் பவளவாய் காண்பேனே) - Here, AzhwAr prays that he become the stepping stone at the entrance of thiruvEnkamudaiyAn sannidhi (inner sanctum), but he also wants to see the divine smile of thiruvEnkamudaiyAn. Being the stepping stone is like being achith (which does not have gyAnam) but being able to see the joy of bhagavAn means reciprocating the joy of bhagavAn. Since reciprocation indicates presence of gyAnam, here the highest principle of srIvaishNava sath sampradhAyam is revealed. That is, one should be as controllable by the master as pure-matter would be, yet, one should reciprocate the joy of the master which will bring greater joy to bhagavAn. It is also like taking the position of an innocent child, who will let the father fully control him, yet, when the father gives joy to the child, the child will reciprocate father's joy and that will bring greater happiness in the father. Thus, ultimately, bhagavAn is the primary enjoyer and jIvAthmA is the secondary enjoyer - that too enjoying bhagavAn's joy. Focussing on bhandha sAsthram (studying literature related to materialistic prosperity, wealth, progress, etc) which are contrary to mOksha sAsthram (mOksham related literature) is an obstacle. mOksha sAsthram is that which shows the path of performing eternal kainkaryam to bhagavAn. bhandha sAsthram is that which will lead to repeated births in this samsAram in pursuit of sensual pleasures, etc. One should focus on mOksha sAsthram and ignore bhandha sAsthram. Having attachment to taking care of ones own body and bodily aspects which are contrary to the ultimate goal of serving ones own AchArya is an obstacle. charama kainkaryam - charama parva nishtai - ultimate service which is considering "ones AchArya as everything and serving such AchArya". In upadhEsa raththina mAlai, mAmunigaL explains in pAsuram 65 "AchAryan chichchan Aruyiraip pENumavan thEchArum chichchan avan chIr vadivai Achaiyudan nOkkumavan" (ஆசார்யன் சிச்சன் ஆருயிரைப் பேணுமவன் தேசாரும் சிச்சன் அவன் சீர் வடிவை ஆசையுடன் நோக்குமவன்) - AchArya is to be fully focussed on the true nature of sishya (jIvAthmA) and sishya is to be fully focussed on the body and the bodily needs of the AchArya with great devotion. Since AchArya's daily material (bodily) needs (like food, shelter, clothing, etc) is the responsibility of sishya, the sishya should have more attachment towards that over his/her own bodily needs. Simply engaging in ones own bodily well-being must be given up. Translator's note: upadhEsa raththina mAlai brings out the essence of srIvachana bhUshaNa dhivya sAsthram. mAmunigaL beautifully extracts the essence of the principles that are explained by piLLai lOkAchAryar and presents them in very easy to understand thamizh pAsurams. Focussing on AchArya and serving him is greatly emphasised by piLLai lOkAchAryar and the same is eloquently explained by mAmunigaL here.